In GD&T the Profile of a Surface symbol is used to establish a 3 dimensional tolerane zone around the surface, which is often a complex curve or shape. This control requires that every point on the surface must lie within a tolerance range that mimics the surface profile. In other words, take two exact copies of the ideal surface, separate by exactly the Surface Profile tolerance, and every point on the controlled feature must fall within that tolerance zone. Because of this tolerance zone, the Profile of a Surface can control the feature’s form, size, orientation, and sometimes even th location. It can be a good choice for parts that have a complex outer shape but a constant cross-section such as extrusions. Profile of a surface can often wind up being a catch-all for surface control. In other words, if you can’t figure out how to control with another symbol, take a look at using Profile of a Surface. 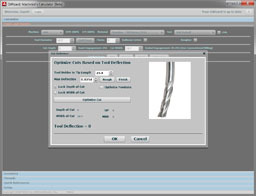 Above is a typical example of a callout for Profile of a Surface on a drawing. Given the complexity of the 3 dimensional surfaces being controlled, the Profile of a Surface is usually measured with a CMM. If a relatively simple surface is called out, for example a radius on a corner, it can be possible to sweep the feature with a height gage and verify the tolerance..